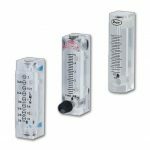 Dwyer Instruments, Inc. offers many flow measuring products including our very popular variable area flowmeters, often called rotameters. 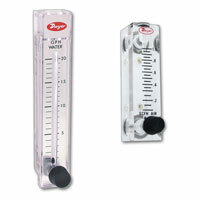 Dwyer manufactures variable area flowmeters in polycarbonate, poylsufone, fluoropolymer, acrylic, glass, and metal. Please see the Dwyer website for more details on these products. Variable area flowmeters are suitable for measuring liquids or gases by allowing the media to freely move a float through an upright tapered tube until the balance of the downward weight of the float and upward force of the flowing media are in equilibrium. When the flow increases, the media generates more force, which pushes the float further up the tube. 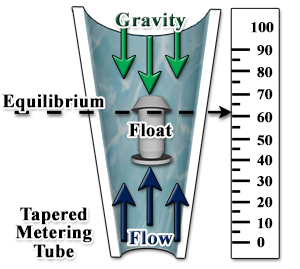 The distance the float moves is proportional to the flow rate as well as the circular gaparea between the float and the tube. The flowmeter body is marked with a flow scale and the flow rate is directly read off of the scale at the level of the float. 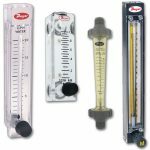 Most variable area flowmeters are transparent and the float can be seen through the body. Variable area flowmeters need to be orientated in the vertical position to take a reading. The floats can be different shapes, with balls being read at the center point and shuttles being read at the widest point at the top. Typically, the longer the flowmeter body and scale, the higher the accuracy. 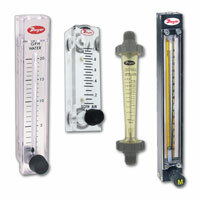 Variable area flowmeters have scales that are calibrated for specific media at specific conditions. Most commonly, the flowmeters are calibrated for air for gas use, and water for liquid use, at standard atmospheric conditions . When using the flowmeter at conditions other than the standard, the flow reading will not be accurate and corrections will need to be made. If manual corrections are not desired, Dwyer offers scales calibrated for other specific media; for example, nitrogen versus air. Dwyer can even create custom scales calibrated specifically for your application media, operating pressure, and temperature. Please contact our technical sales department for already existing scales or to have your own custom scale created. Variable area flowmeters are often used in applications that require adjustments to flow rate. Integral metering valve options are available to change the flow rate through the flowmeter. Variable area flowmeters continue to have a major part of the industrial market due to their low cost, relative accuracy, reliability, and simplicity. They are available in a wide variety of materials and can be used with a wide range of liquids and gases. They are not suited for media that is opaque (which would mean that the float cannot be seen), media that coats the inside, or media that has particulate that will clog the meter.